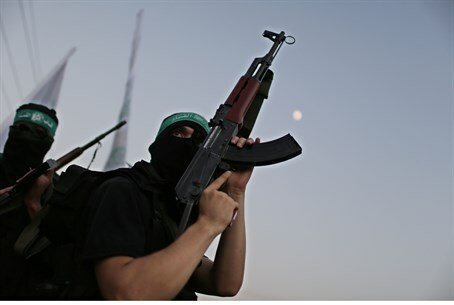 Continued clashes between Hamas and Fatah belie the facade of their new "unity" government, as news reports throughout the week show. On Friday, disgruntled Palestinian Arabs stated that the discord continues to be expressed not only through police crackdowns and violence - but also through the legislative process. Fatah members told Fox News reporters Friday that a compensation plan had been drafted in the new government to pay reparations to families affected by violent clashes between the two groups. However, the commission would need at least two years and $150 million to review and settle any claims, according to panel member Ashraf Jumma - and, as of now, there is no funding at all for the committee. Bereaved families also spoke out, claiming that they were not interested in compensation or negotiation - only revenge. "I don't want compensation...I want punishment," Hamza Rafati, the 22-year-old son of a slain Hamas terrorist, told Fox News. He slammed the compensation bid for causing his family to lose their "right to legal revenge after unity." The "unity" agreement aims to bring an end to the longstanding feud between Fatah and Hamas, which began in 2007 when Hamas took control of Gaza in a bloody coup and started cracking down on Fatah officials living in the territory. About 400 people were estimated to have been killed during the clashes, although the data stems from Gaza-based "human rights" groups. Hamas and Fatah have shown a limited degree of tolerance for each other, as each released and pardoned their political prisoners in a surprise move in early May. However, tensions continued to boil under the surface even after the unity agreement. Hamas bank workers broke out in fistfights with Fatah co-workers in Hevron on Thursday over salary disparities; on Friday, Fatah arrested over 100 Hamas rioters in Hevron, and Hamas arrested at least one senior Fatah member in Gaza. Much of the international community's approval of the "unity" government has been predicated on the concept of unity within the Palestinian Arab world, which analysts claim makes a peace agreement between Israel and the Palestinian Authority more likely.